This article is about the Game & Watch system. For the character of the Game & Watch games with a similar name, and named "Game & Watch" in Japan, see Mr. Game & Watch. Not to be confused with Nelsonic Game Watch. 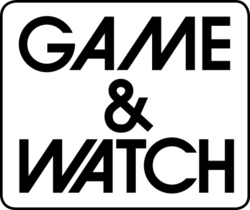 The Game & Watch series is a series of handheld games developed by Nintendo from 1980 to 1991. Each Game & Watch had its own game built in, in addition to a clock and an alarm. The units are based on a 4-bit CPU from the Sharp SM5xx family, which includes a small ROM and RAM area and an LCD screen driver circuit. Some of the titles available in Game & Watch format were games as random as Ball, a simple juggling game, to well-known games such as Donkey Kong Jr. The Game & Watch series was Nintendo's earliest product to be very successful, selling a combined 43.4 million units worldwide. Most Game & Watch titles have two modes: Game A and Game B. Game B is usually a faster, more difficult version of Game A, but in some titles, such as Flagman and Bomb Sweeper, Game B is slightly different than Game A. In a few others, such as Judge and Boxing, Game B features a two-player mode. The titles Climber, Balloon Fight, and Super Mario Bros. do not have a Game B. The Game & Watch games normally become harder as the player progresses, but the gameplay usually slows down every 100 points the player receives. The games usually end when the player receives three misses (generally meaning "lives that are lost"). In most games, misses can be removed if the player reaches a certain number of points; in some games, doing so with no misses will increase the score either temporarily or until a miss is made. Some of these were re-released in the Mini Classic series. These games are Game Boy-era ports of the classic Game & Watch titles, most of which are also given "Modern" versions featuring Mario characters. The "Classic" versions remove the timekeeping functions from the original games, in order to allow the player to accomplish the compilations' goal of getting the highest score possible. In addition to all the games listed below, the Mario Game & Watch games also reappear, with their "Modern" versions featuring updated graphics and gameplay. Games marked with an asterisk (*) have no Modern Mode in their ports. 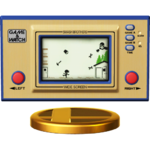 In Wario: Master of Disguise, there is a parody of the Game & Watch, called the Game & Watch 9000. In WarioWare: Smooth Moves, 9-Volt holds up a Donkey Kong double-screen Game & Watch. 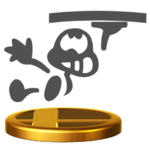 Starting with Super Smash Bros. Melee of the Super Smash Bros. series, Mr. Game & Watch has made an appearance as a playable character, representing various games as his attack moves. The stages Flat Zone, Flat Zone 2, and Flat Zone X are inspired by the handhelds. G&W Fire (7/1980) Many fans of modern handheld games will fondly remember the classic Game & Watch games they played years ago. Save people from a burning building using a trampoline, bouncing them to the waiting ambulance and safety. G&W Lion (4/1981) Back in the day, there were a lot of kids into the Game & Watch series. Quite a few adults as well, honestly. This game was a popular pick, with players controlling two zookeepers as they tried to keep the lions from escaping. The built-in clock was great for keeping track of your time spent playing! G&W Oil Panic (5/1982) The Game & Watch Multi Screen series is the big, big brother of the Nintendo DS. One classic title was Oil Panic, which puts you in charge of a petrol station that's sprung a leak. As oil drips down on the upper screen, you've got to catch it in buckets on the lower screen or risk an angry customer with a face full of oil! Helmet G&W Helmet (2/1981) Better than a regular ol' watch is Game & Watch. One of the classic titles is Helmet. Move from left to right, avoiding the falling tools. If you get hit, you'll fall down and lose your helmet. What kind of helmet falls off after only one hit?! Good thing this game is so fun you'll overlook that. Manhole G&W Manhole (1/1981) No scrolling, only one stage, only a few sounds, and the age of 3D was nothing more than a twinkle in someone's eye. Nevertheless, this game was a blast at the time. In the Game & Watch title Manhole, you move a manhole cover back and forth so that the pedestrians can safely cross the road. What a simple yet fun game! This page was last edited on April 20, 2019, at 11:15.